Between 5th and 8th June 2014 Portsmouth held events to mark the 70th anniversary of D-Day. A veteran’s centre was opened on Southsea Common to provide a focal point for the veterans and their families to congregate during the commemorations. On Thursday 5h June the events started with a Drumhead Ceremony on Southsea Common featuring the Band of Her Majesty's Royal Marines. 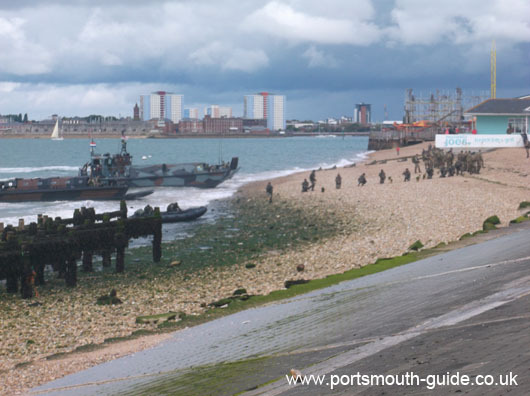 Later that day the Royal Navy and Royal Marines enacted a spectacular amphibious assault landing on Southsea seafront (shown above) followed by a display by the Red Arrows. That evening saw a concert for heroes produced by the Bournemouth Symphony orchestra paying tribute to the veterans. On Friday 6th June Portsmouth held a remembrance service at the D-Day stone. On Saturday 7th June there was an armed forces reserve parade along the seafront followed by arena events in the afternoon which included; marching bands, field gun displays and the RAF Falcons Parachute display tem. In the evening there was a 1940s concert and firework display. Arena events continued on the Sunday 7th June.